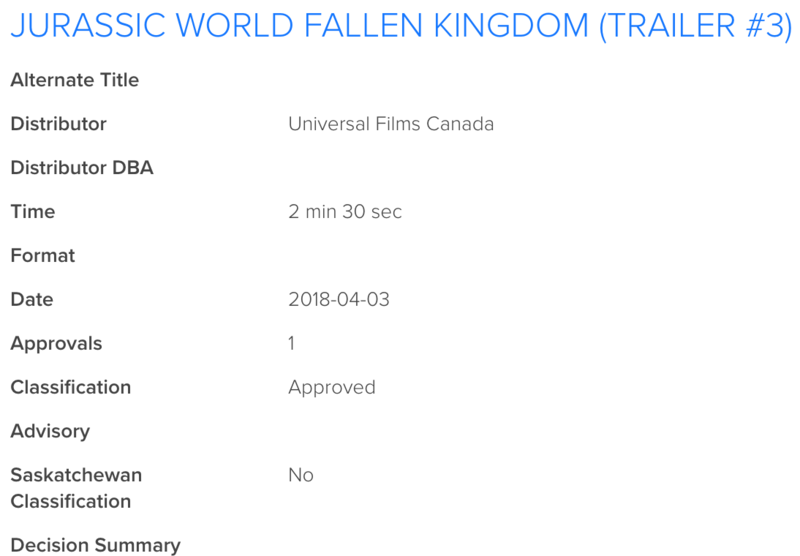 The third and presumably final trailer for Jurassic World: Fallen Kingdom will be with us imminently, and it’ll stretch for exactly 120 seconds. At least, that’s according to Trailer Track. Citing a Consumer Protection listing (see below), which first reared its head on Tuesday, TT suggests that Universal may be saving its final showcase until the release of Avengers: Infinity War in three weeks’ time – or, failing that, there’s always the release of Warner’s Rampage on April 20th, by which point we should have our first preview of Meg and its seemingly “excellent” trailers. As for Fallen Kingdom, previous teasers have largely focused on the volcanic eruption – a volcanic eruption that’s said to occur in the opening 30 minutes – so we’re hopeful that Universal is about to peel back the curtain on some new material and that all-new dino hybrid. Set four years after the calamitous events of Jurassic World, in which the famous resort succumbed to dino-infested anarchy, Fallen Kingdom has some mighty big boots to fill if it’s to emulate the meteoric success of its predecessor. And true to Universal’s initial plan, the Powers That Be are already making preparations for the third, conclusive chapter in their Jurassic World revival. It’ll be helmed by Colin Trevorrow, too, who took control of the 2015 blockbuster only to depart for Star Wars: Episode IX soon thereafter. Sadly, that collaboration between Trevorrow and Lucasfilm turned sour, leading the latter to appoint J.J. Abrams at the helm of Episode IX ahead of its own release in 2019. Closer to home, Jurassic World fans will bear witness to that Fallen Kingdom on June 22nd. And if Universal’s release schedule is any indication, Trevorrow’s threequel ought to be with us in 2021. Watch this space for more.